Need ballistics data but don’t have a program? …You’re in luck. Check out JBM’s real-time interactive online ballistics calculator. It’s very fast, very accurate, and it includes windage corrections and time-to-target data. Just plug in bullet weight, BC, muzzle velocity, wind speed and angle and it will plot bullet trajectories from 50 to 1000 yards for you. The JBM program has also recently been updated with actual G7 values based on field tests by Bryan Litz. CLICK HERE for the latest JBM Trajectory Calculator. CLICK HERE to choose among various calculator options. You can even print out customized Trajectory Cards with Click Values. 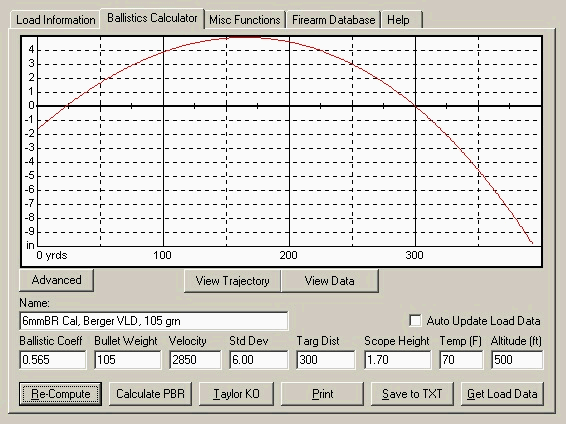 Another sophisticated free program, well-suited for VLDs, is the Pejsa Ballistics Spreadsheet. You will need Excel to run it. Right-click and “save as” to download here: Pejsa Ballistics Spreadsheet. For field use, the spreadsheet prints a small MOA trajectory and windage table to stick on a gunstock. The spreadsheet will run on a WindowsCE or Psion hand-held computer so you can adjust for atmospheric conditions, wind speed, etc. in the field. For use with a rangefinder, the spreadsheet can calculate windage and elevation MOA for any particular range. At $199.00, the new CED M2 Chronograph offers the best performance you can get in a Chrono for under $400.00 (as long as you don’t require built-in printing). It is more repeatable than lesser-priced brands in “less-than-ideal” light conditions, and the control unit is much easier to use than the “folding box” variety. Representing a significant upgrade over the previous CED “Millenium” model, the new M2 has more memory and can clock a wider range of bullet speeds–from 50 fps all the way to 7000 fps. The upgraded M2 will record velocities at much lower light levels than the previous Millennium chronograph. Included with the CED M2 are chronograph, sensors, cables, screen mounting bracket, USB computer cable and CED Data Collector software. The PACT Professional XP offers all the features we want in a Chronograph at an affordable price — starting at just $239.00. The skyscreens are easy to set up and store compactly. The base unit has large, easy to use controls, and contains a built-in printer. Having an integrated printer is a major “plus factor” for the PACT compared to other chronographs currently for sale. However, we found that the PACT drains its battery quickly. You may need multiple 9-volt batteries for a full day of use. The PACT features an upgraded sensor design that makes it more reliable and repeatable. New Glint Guard 2TM bullet detection system offers even greater accuracy and sensitivity in the widest range of light conditions. An enhanced PC interface lets you download your ballistic data to your computer and upload new bullets from your computer to your PACT chronograph. The optional IR system is useful, but our tests showed that it was more “fussy” than the optional IR on the CED M2, as it has a very narrow “sweet spot” to shoot through in low light. The best unit for low-light shooting is the PVM-21 by far.. The Oehler model 33 and 35P (with printer) chronographs were out of production for a couple years. However Oehler Research has recently resumed limited production of these classic units. If you want the most trouble-free chrono you can buy, grab an Oehler 35P while you can. They are simple to use, but the wide sensor spacing and dual-channel measuring process gives you very reliable results.And in daytime conditions, the Oehlers are not fussy. We have personally witnessed the superiority of an Oehler 35P, compared to a Shooting Chrony. Under bright, noon-time overhead light conditions, the Chrony produced an error every third or fourth shot and even when we got a recording, the number seemed off by 150 fps or more. Switching over to an Oehler 35p on the same benches, the errors disappeared and the velocity readings immediately moved into the reasonable, predicted range for our load and bullet. Better engineering and subcomponents explain why Oehlers work better that Chronys. Oehlers use focused beam lenses for less diffusion, plus a longer screen-spacing for greater precision and accuracy. Oehler’s reduced production of its Model 35 chronograph line has left a void in the market for high-grade chronographs. The new PVM-21 chronograph from Germany will fill that need. It has many advanced features and comes packaged with very sophisticated (though sometimes frustrating) software. With the PVM-21, which employs multiple infrared emitters, you can use the chrono in any light condition–indoors or outdoors. Tests of two PVMs set in parallel proved the units give extremely consistent results. Measuring a 55-grain .223-caliber bullet, two units showed an average variance of less than 1.5 fps on the shot by shot readings. Compared to an Oehler, the front and rear light sensors are placed fairly close together. With conventional engineering, longer spacing normally produces more accurate and reliable results. However, the PVM-21 employs a very high measuring frequency (16.0 Mhz) to provide excellent results even with compact dimensions. Additionally, the unit samples ambient light every 10 seconds allowing it to automatically adjust to changing light conditions. The PVM-21 features a 250-shot memory, and full PC-compatibilty via USB interface. Output can be displayed on a laptop PC, as well as the LCD readout on the PVM-21’s display unit. Being able to display/record info directly to a laptop PC is great. However, the software is buggy and unnecessarily complex. When it works, the software is very powerful, but we experienced multiple connectivity issues and unexplained software crashes. Also, when you’re outdoors in direct sunlight, you’ll find it is hard to read data off the laptop screen. That’s not a design problem — it just means you’ll want to stay in a shaded area to use the PC display capability. The PVM-21 is very easy to mount on a tripod and it probably has the largest “sweet spot” (for bullet travel) of any chronograph on the market. When we go in the field we usually take the PVM-21 because it is easy to rig, and because you can count on it to work in any light conditions from super-bright to complete darkness. We do wish, however, that it came with a built-in printer (like the Oehler 35P), and that the 12v battery was integrated into the processing unit. Copyright © 2005, 6mmBR.com, All Rights Reserved. No reproduction without advanced permission in writing. Oehler 35P Chronograph is BACK!